Shy bookworm, Beth O'Connor, has grown up. Her hair is bobbed, and she now goes by the name, Lizzie. Unfortunately, John Brady, still thinks of her like a kid sister. Lizzie turns to her older sisters, Faith and Charity, for advice and the fun begins. Julie Lessman builds upon previous books. As in life, we see how the choices Lizzie and her family make affect their futures. While the book is sassy like the others, strong values are promoted. The characters experience all the trials, tribulations, and joys of life. For the last month and a half, I've had my nose buried in Julie's series. I read, "A Passion Most Pure," while dealing with a migraine. A Passion Redeemed kept my attention, and Charity finally won a place in my heart. "A Passion Denied," robbed me of sleep because I couldn't bear to put it down before finding out what happened to Lizzie and Brady. Ah Julie, thanks for many hours of reading pleasure. I'm watching for the next title in The Daughters of Boston series. 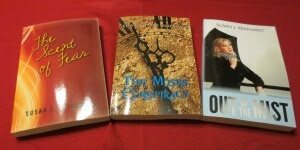 I hope all of you will enter Monday's drawing (May 25th) for these books. The deadline is fast approaching, so don't miss out. Scroll down and get your comment in before it's too late. I just love that Julie Lessman is so personal with everyone. She is so sweet! I would buy her books for no other reason than because I like her so much! But I'm hearing so many good things about them now, that I can't wait to read them. Chicki here! I'm taking your advice and posting everywhere you show up! I really looking forward to reading your work, because I believe it will help me when I rework the two inspirational manuscripts I've written. Great review! I'm so eager to get my greedy eyes on this book. LOL! I am almost through with Julie's first one and have had such a hard time putting it down, as I knew I would! I won the whole set this week and can't wait to finish this series...I keep hearing how great they are. p.s. Jump over to my blog today...you are mentioned! Congratulations! I know you'll enjoy all of Julie's books. I'll pop over to your blog a bit later. With all the contests going on, perhaps you'll be a winner! Thanks for visiting my blog. I hope you'll stop in often. BTW, I'm running a drawing right now for Julie's books. Please check out the previous post for details. I agree. Julie's been wonderful and so encouraging. Wasn't this book terrific?! For that matter wasn't the series one of the best!!!! They kept me up all night too Susan so I know how you feel! Love your blog too! JODY ... Gosh, thanks SO much for your sweet comment, but I actually really, really love connecting with readers, because we're ALL readers in Christ, right?? But I am excited that you want to read my books, so THANK YOU!! And don't buy them if you don't have to -- just check out my website calendar for blog giveaways in May and June so you can try to win a signed copy. Sherrinda actually has won FIVE of my books in the last two weeks because she, as she put it, "cyber-stalked" my giveaways. I don't mind, trust me! CHICKI ... good girl!! Post away, and good luck to you in the contest ... this one, or one of the others. Your chances are good, trust me! And THANK YOU for your interest ... hopefully, I can make it pay off for you! Jessica, you sure should be the next winner, with all the comments you are posting! Thanks for your diligence and support -- hope it pays off! SHERRINDA!!! Gosh, you are ALL over the place, girl!! Glad you are enjoying book 1! SUSAN, you sure run a busy blog here, girl -- thanks SO much for letting me be a part of it! I'm happy everyone is so excited about your books. So, what do you have in store for us next? Katie Rose? The Lord blessed you above and beyond what you could think or dream. You've got Julie's books and one to share. Awesome! You're such a sweetie for turning the last one down from Kara -- thank you! It's kind of sad now ... no more cyber-stalking my giveaways from one of my favorite commenters!! Thanks again, Susan, for hosting me on your blog ... it's a great place to be! Woohoo! For the little girl who was never going to marry, Katie is coming of age. Hmm, do I see Cluny in this picture? Aaarrggghhh...yall have to say "Spoiler Alert" when you are talking about these books!!! So Katie doesn't want to get married and then has THREE love interests???? Sigh...what fun, what turmoil, sounds like a blast. Looking forward to it all! Yes...please say Cluny will be in the next book...he's such a sweetheart! Katie Rose is sooo unpredictable I don't think any of us will know for sure what direction she'll take (or rather Julie). It's hard not to talk about these folks like real people. SUSAN, oh yes, Mr. Cluny McGee is all grown up and quite the bane of Katie's existence in more ways than one! And, yes, Katie wants to get married, but I'm afraid she has ulterior motives (sounds like her, doesn't it?). You've given us some tantalizing details on Katie Rose's story. I can't wait until your next book comes out. I'm so behind in my reading. Just a few days ago, I was at Walmart and saw one of Julie's books on the shelf. I need to get some reading done so that I can enjoy A Passion Denied. Thanks, Susan for the great review. RENEE ... grin, believe me, I would LIKE for you to read it now, truly. I am putting the finishing touches on it for my editor, and I am SO excited about this book. Just promise me that you will NOT forget about me by the time a year rolls around and it comes out, okay?? Julie...not a chance of me forgetting about your books OR you anytime soon! SUSAN, yeah, trust me -- I'm not any happier about the year wait then my readers, truly. But such is life! SHARON!!! You saw one of my books at Walmart????? I've only heard of ONE Walmart sighting, because they don't carry me very often, unfortunately, but I'm glad I show up occasionally, anyway! And, YES, get your reading done so you can enjoy Denied! Woohoo! Has this been an awesome contest or what? We're coming down to the wire. Tomorrow morning, we announce the winners! This post was a review of Julie's latest book.